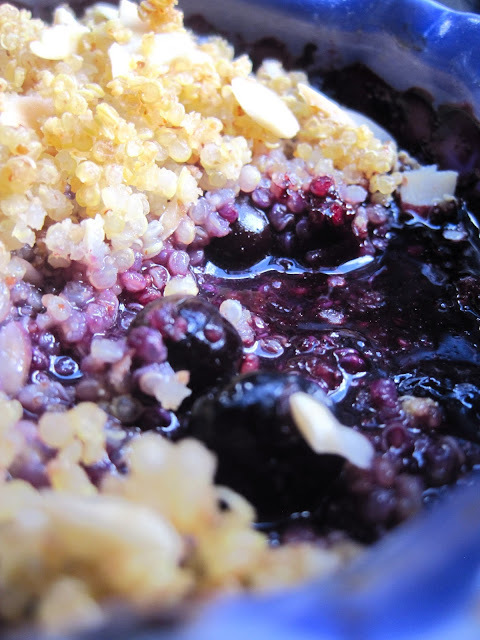 For this Blueberry Quinoa Amaretto Crisp, it was love at first sight. How did the recipe so quickly win over my affection? The answer is threefold: First, alluring me with one of my favorite seasonal summer fruits; second, seducing me with a triple hit of almond: slivered nuts, almond flour, and amaretto almond liquor; and third, courting me with my favorite grain-that’s-not-actually-a-grain, quinoa. The result: a bubbling, toasted pan of perfection, boasting not one but two superfoods. Oh, my heart (and tummy) are so full. The crisp's quinoa topping is not as sweet as you’d presume in this type of dish. While unexpected, I found myself liking it: I treated the dish almost more as a breakfast consideration, rather than dessert. The quinoa mixed with slivered almonds makes for a topping with quite a crunch, which gently coats the real star of the dish: the blueberries. The blueberry-amaretto combination, eaten while still warm, is truly heavenly. It’s like a rich, thick, almondy syrup. I kind of felt like I was eating all the best elements of a blueberry pancake. Then, the quinoa topping caves, falling into blueberry puddle, and that syrup gets sopped up by each quinoa grain. Yum. I’ve never used quinoa in a sweet dish before, and really enjoyed its nutty, grainy contribution. However, I did feel like some of the other elements of the topping—like butter, brown sugar and almond flour—got lost within it. Next time, I will double up on these ingredients. But there is no denying the satisfaction of that quinoa crunch. Mix the blueberries, sugar, cornstarch, amaretto, lemon juice and vanilla and place in an 8x8 inch baking dish (or a number of smaller dishes). Mix the quinoa, brown sugar, butter, flour and almond slices and crumble on top of the blueberries. Bake in a preheated 350F oven until it is bubbling and the top is golden brown, about 30-45 minutes.